The little birthday girl loves balloons so we went with a hot air balloon themed birthday. Balloons balloons everywhere! Our tiny dining room was the centre of the action. I made some ombre rainbow flag bunting and strung it up corner to corner. Its a bit of a tradition for us take some of the decorations and put them in her bedroom so that's where these will go soon. We took the hot air balloon that was hanging in her room and hung it from the chandelier. It fit perfectly over the cupcake tower. 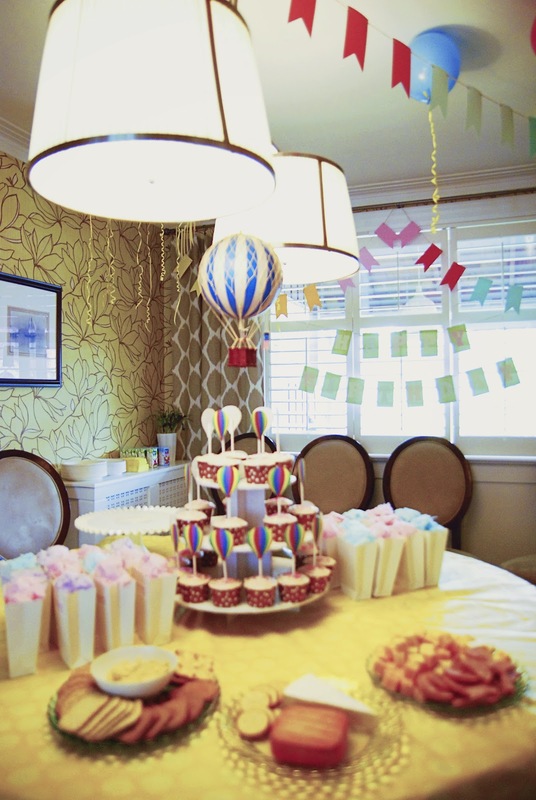 I made some hot air balloon toppers for the cupcakes. I baked the cupcakes in these cute baking cups - fun to look at but the cup didn't really peel away and you had to eat the cupcake using a fork. The cotton candy, on the other hand, was a big hit! Puffy bites stuffed into these scalloped popcorn boxes from Creative Bag transformed them into Cotton Candy Clouds. 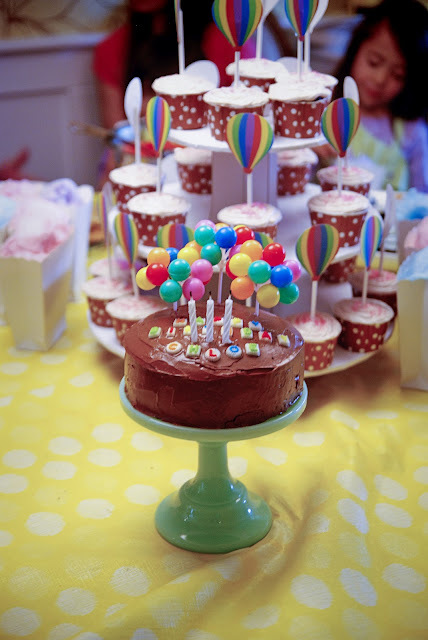 More balloons on top of the cake I made (well, the cake Betty Crocker and I made!). My mom made some of our birthday cakes growing up and it was something I wanted to do for Chloe. Did your mom do that for you too? We had some silly fun indoors and out. Even Oscar got in on the bubble action. 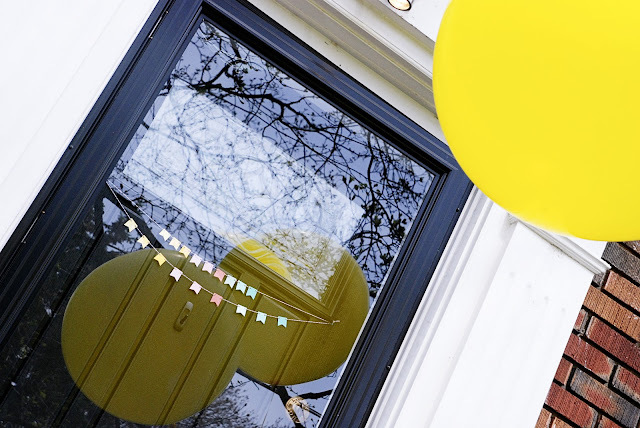 Big Yellow Balloons!!! I got mine here. This little girl ran around all day with her cousins and friends, skipped her nap, and stayed up till 9pm hopped up on cupcakes and sugary sweets. Isn't that what birthdays are all about? 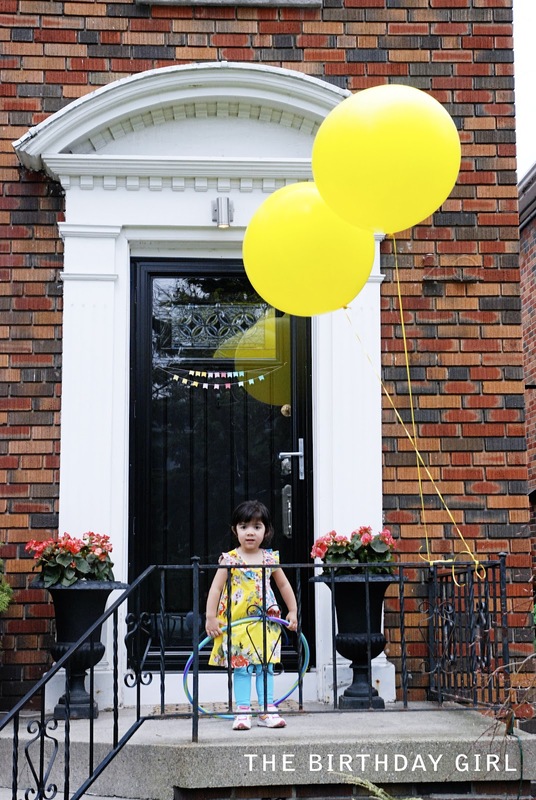 What an adorable party for an adorable 3 year old (3 is my favourite age, by the way - they say the cutest things). I love all the balloons. My daughter had the same balloons that you put on her cake to use with her Barbies - they are the perfect size. 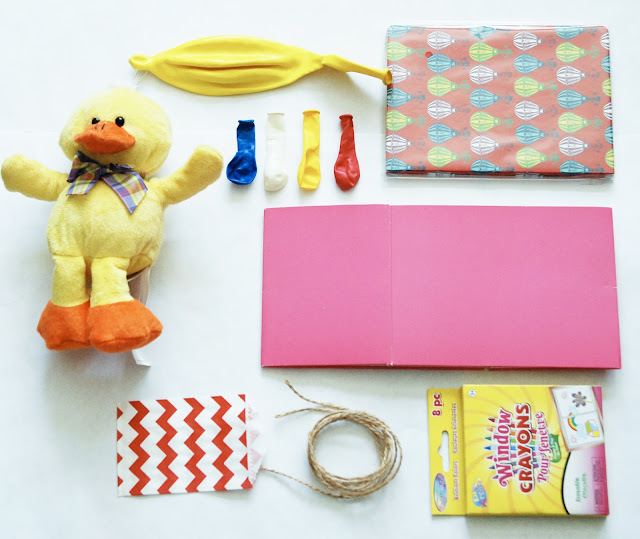 I wrapped little boxes and found a little plastic cake so she could play birthday party. 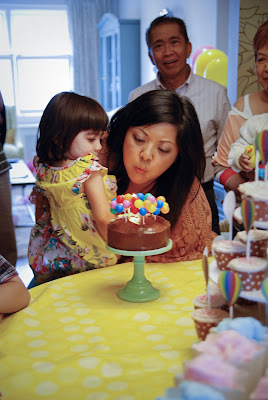 I loved making homemade cakes for my kid's birthday parties as well. I found the best book that I got designs from. I'll have to do a post on it soon as it made the whole decorating a cake thing a lot easier - and more fun. I have to admit, I got a bit teary reading the beginning of your post. I can't believe how quickly these little sweethearts grow up either! What a fantastic party. I love the balloon theme, especially because it is so meaningful to Chloe! Looks like everyone had a great time, and you two looked so cute blowing out the candles on your awesome homemade cake (going to attempt that for Hunter's next birthday!). so cute!!! and what a fun birthday party for sweet little Chloe! She is so cute standing in front of her "fly away" poster and pointing away .. this young lady will grow up giving order! Love your decoration and seriously you will have to tell me where you get all your templates and printing done for all these decoration. They look so professional and absolutely amazing! I also had a little "moment" with cupcake holders. They looked great prior to baking and the cake actually easy to pop off. But these holders were in light color and the cakes were in light brown... .so once baked, the color of the cake totally took over. Now I wish I was at the party! Love those little takehome bags. So creative! I'm truly starting to see that they DO "grow up so fast". So happy yet heartbreaking at the same time! Happy Birthday beautiful Miss Chloe! J, you are flippin' amazing. I'm off to pin everything about this party, love it so much!! Happy 3rd Birthday Chloe!!! 3 is such a fun age. 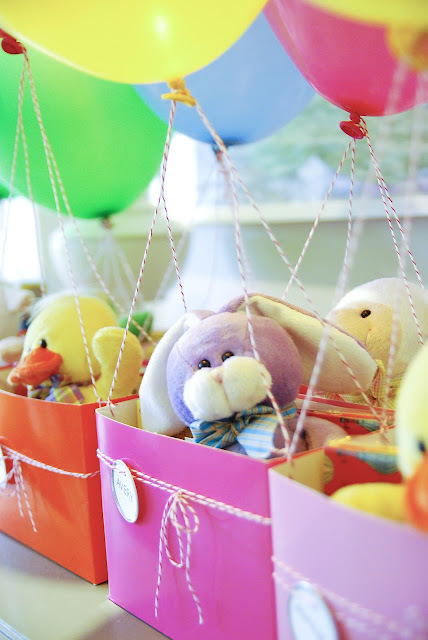 I love those gift hot air balloon bags...so cute. I totally know what you mean about not wanting to sit still for hugs. I usually have to pin my daughter down and then kiss her a million times. Secretly she loves it (that's what I'm telling myself). Thanks Giulia. The balloons were instant happiness! I made the mistake of doing the balloons on the loot bags the night before and they were all sinking by the next morning. Grr. 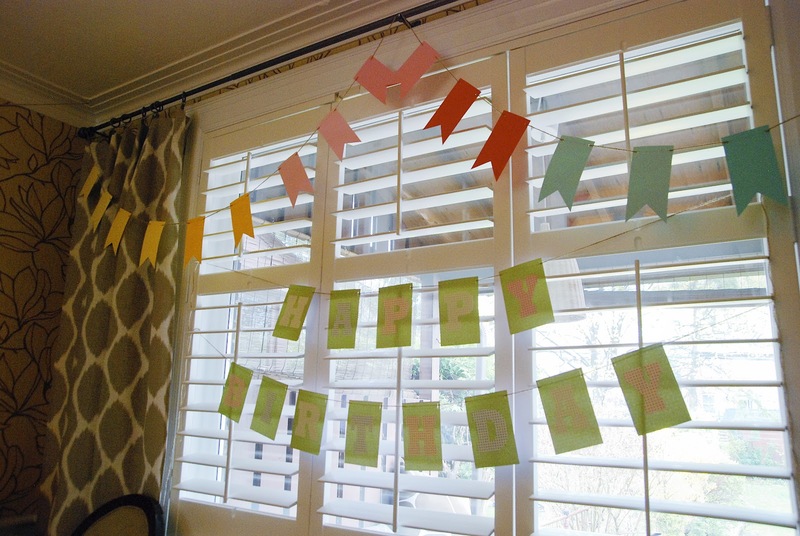 The door banner was made with the extra bits of paper from the larger flag bunting. Dear Chloe...One day you are going to realize your mom rocked at throwing you parties! Happy birthday to you! I love those Gift-Bags! Very CUTE!! -- But, prepare to keep going Higher End on the contents as She gets older! ..Was at 5-yr-old party years ago in Vancouver..One Kid [in the presence of his father even] started "complaining" about his "bag"! What a fun birthday party for Chloe! 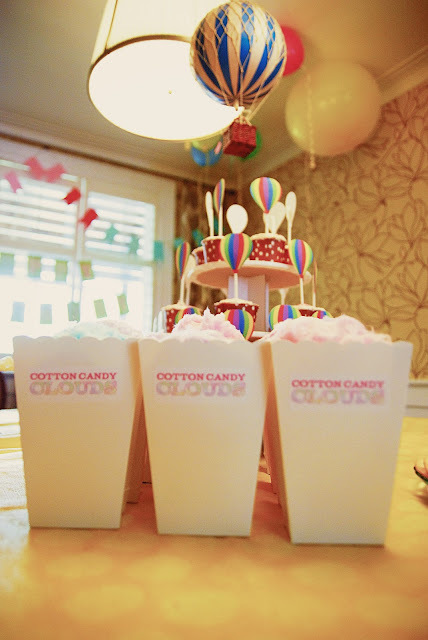 So many lovely details, love the ombre flag buntings, the little balloons on her cake and how fun are those cotton candies! I also like the "Pin the Chloe on the balloon" poster, it's very cute and chic! Today is my birthday too but I already had an early celebration yesterday with my family. Oh my goodness, your house looked stunning! What a fabulous birthday party. Great theme! I love the hot air balloon favor bags! Genius! I know I'm a little late to the party (ha! ), but what a beautiful, age-appropriate event! It looks beautiful, and it looks like a real child's party. 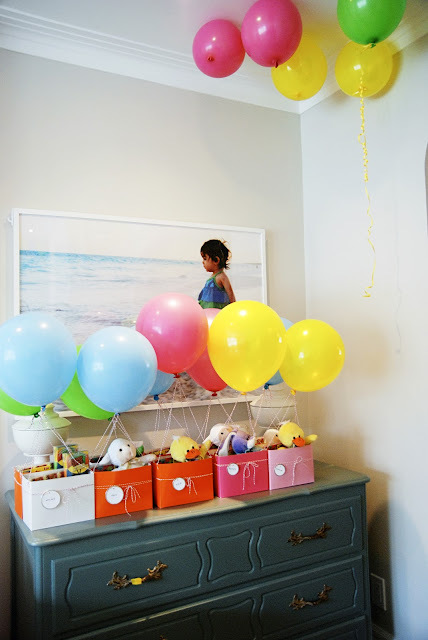 Oh, that's a great idea to create a mini birthday party! Thanks! Happy happy belated birthday to Chloe! I loveeverything you did--the balloons are just magical. And I love that Oscar was there! Friends! oh my gorgeous magazine-worthy party! love all the little details that are so amazing. happy birthday cute Chloe! Happy birthday to your baby! My little guy is going to turn 4 in a few months and I just can't believe it!!! love all those balloons!! What an awesome party, Jen! ALL the details are just fantastic. I always loved getting loot bags as a kid and these ones are awesome!! My favourite detail for sure, the kids must have loved them. Aw, thanks FC! I can't wait to see what you come up with for Quinn's first birthday... not that I want that to come up anytime soon...keep her as a cute little baby as long as you can, m'kay? Chloe is one lucky girl! Happy Birthday to her. 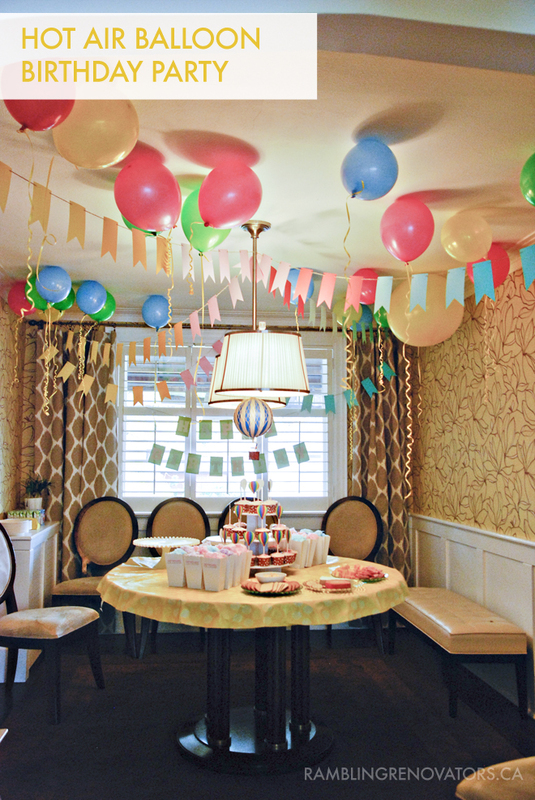 Amazing job on the B-day party mom. oh that's just too cute!! Oooot! My birthday's coming up - can you throw me a party? :) Looks amazing, the details are fantastic and I love the photo of Chloe impersonating herself in the hot air balloon!! I love the theme. Such a creative idea, and the bright colours are wonderful. Looks like such a fun birthday party!!! Chloe is a very lucky little 3 yr. old!! Happy Birthday! So glad you and Oscar could come out for a bit. He was so adorable. xo. same here on the balloons! 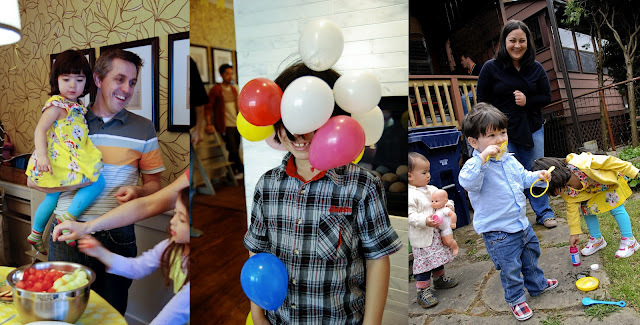 We blew up 80+ balloons the night before and they all started to sink ;(, but the kids loved kicking them around, so it all turned out great. I blew up a couple more for the loot bags in the morning. We already had one little guest complaining about the bag, ha! Yes, that's my favourite cakestand. I bought it from Fishs Eddy years ago and have never had a cake small enough to display on it until now. Thanks Jessie. Happy birthday to you! Hope your day is sweet. Happy Birthday Chloe! I hope three is your best year yet. What a great party! I love the loot bags and Chloe is so cute! I love all the decor so much but that last picture melts my heart. She is so sweet! Sounds like a fantastic day! Happy Birthday Chloe! 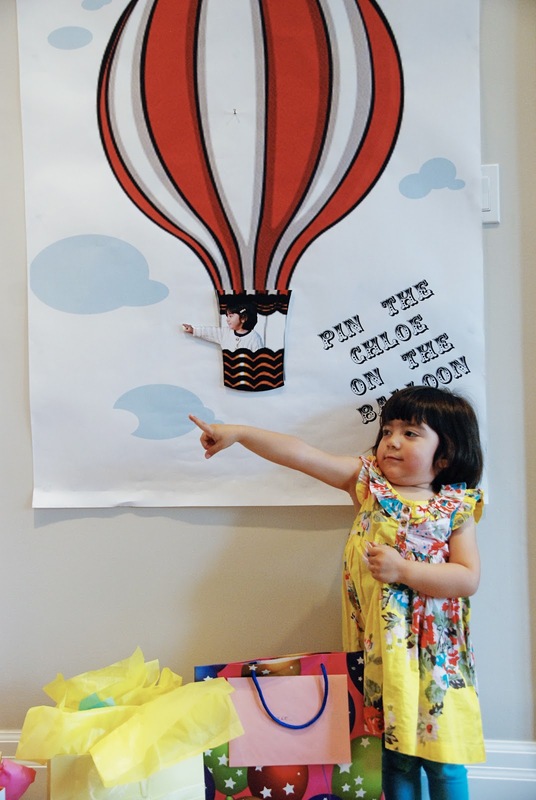 I love the "pin chloe on the balloon" image. Too cute! I love all the details - you are very creative Jen!